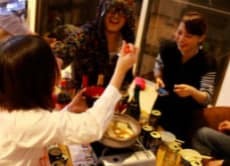 The concept of "the share house where your days and nights get the wrong way around – Tokyo Night Hills", so called "Yoru Hill" is "the platform of youths who are making projects with their days and nights being reversed". Highly motivated youth find some theme and establish all kinds of projects in their own way. They are like, "This kind of action might be needed. Why don't we do it!?". While they are doing these things, they end up working on various activities feverishly regardless of day and night. I thought that if there is a place where these foolish and nice people can hang out and interact, it will be great. Therefore, we wish this share house to be the one where many kinds of people and theme get mixed up and result in something nice.